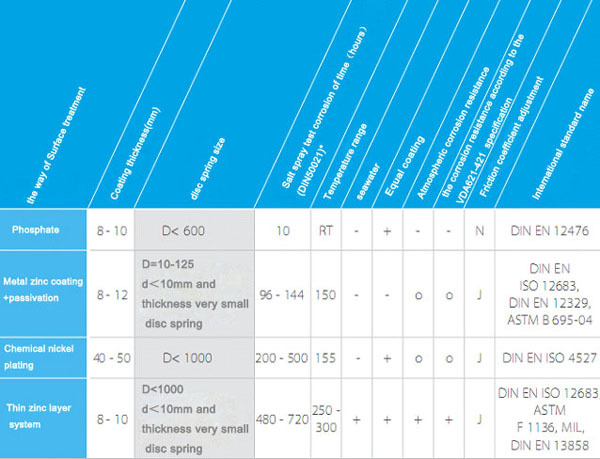 The surface treatment of disc spring is important,it is measure disc spring quality essential link. In many outdoor occasions, the disc spring will come into with rainwater, seawater, river water and other corrosive substances. In the automotive, steel construction, food industry, steel structure bridge, the space industry will come across corrosive substances. Except water, chlorine solutions, acidity material, different concentrations of residues and substances will often touch with the disc spring. So a single surface treatment method, can't provide adequate protection, must according to different environment and make corresponding surface treatment. 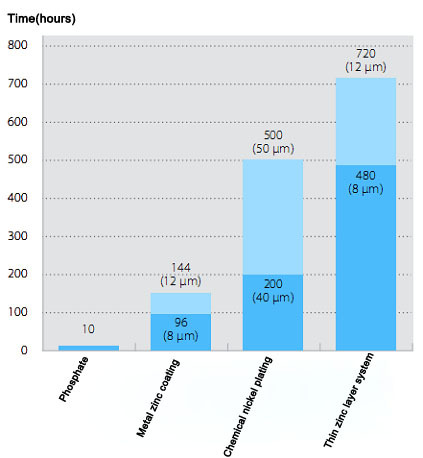 The figure below shows a variety of surface treatment process required time. The following figure shows the various surface treatment processing properties treatment and the reference standard.